I cracked open my copy of Container and started playing some sample rounds while reading through the rules. The mechanics seem relatively straightforward but wow…knowing what to do when is going to take a few games. I can see why they’ve added a “beginner” rule that helps getting some money at the beginning of your turn because money is extremely tight. As they state clearly in the rules, the economic system is unforgiving and difficult to master. The components are great but the “card” money feels a bit lame. However, they needed some way for players to secretly bid on container shipments that arrive at the foreign island so I’m not sure what other option they had. I might have preferred coins in the closed hand. The summer months are a scheduling nightmare but we managed to collected a small group this month for some light gaming and socialization. A few weeks ago I was talking with some friends at one of Noah’s baseball games and they recounted a recent trip to the horse track during a company outing and that got me thinking about Winner’s Circle. So last night, when I knew that same couple was coming I pulled out the game and we set it up for three races. I’ve written about Winner’s Circle in the past but you set up 7 horses with varying capabilities, each player places bets, and then you take turns moving the horses around the track using offensive and defensive moves in an attempt to move the horses you’ve bet on closer to the finish line. The top three horses pay out on bets and the player with the most money at the end wins. Each horse must attempt to move once each round and how much it moves is dependent on the statistics card flipped up for the horse in addition to the position of other horses on the track. 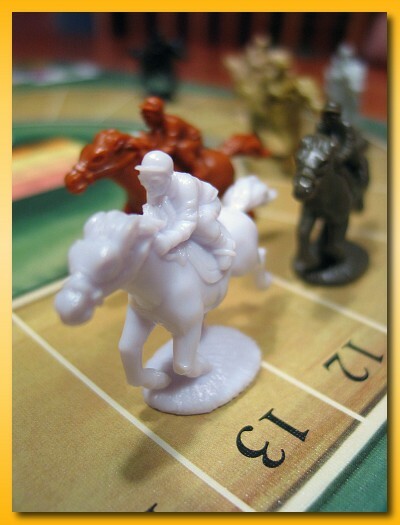 The card describes how well the horse moves in 4 different categories. It sounds a bit more complicated than it really is. I usually do relatively poorly and it showed again last night. It’s a good thing I don’t go to the real track! One couple left early so the remaining four of us talked for a bit over three games of Sushizok im Gockelwok. Sushi is proving to be a big hit with everyone I’ve introduced it to. Small, very easy to play, and very quick. We knocked out three games in about 35 minutes. Everyone, thanks for coming and we’ll be here next month as usual. The last CABS meeting I attended was way back in late July or early August of 2006. My life was getting pretty hectic at the time and I was burning out on gaming. When Friday rolled around I didn’t feel much like gaming and it was a chore to get myself up and over to the hall. The fun was gone and I let my membership lapse. But, the break did me some good. Life pressures have seemed to calmed down a bit and although I still have a relatively busy schedule, my gaming-foo is back and I think I can swing at least periodic attendance. After talking with Lisa, I’ve registered for the Buckeye Game Fest held October 1-4 and I’ve included in my registration fees enough cash to pay for a membership through the rest of 2009 and a full 2010 membership. I doubt I’ll be able to attend even two-thirds of the scheduled meetings but I’m hoping to get in a good dose of gaming beyond what I’m getting at home in my two gaming groups that meet monthly and what I get playing opportunistically with family and friends. The next two weeks are booked with small trips but I hope to jump-start my CABS gaming on an upcoming bonus Saturday with a whole day of gaming at the end of the month. 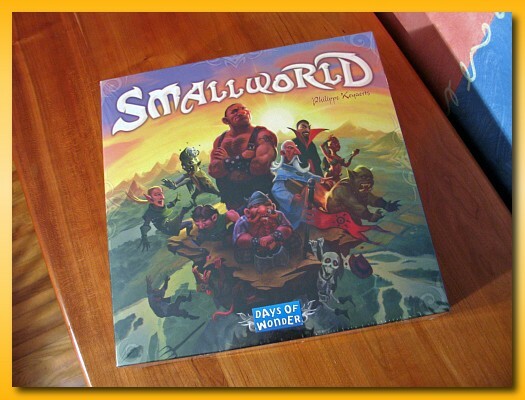 Small World arrived today. I haven’t cracked the shrink wrap yet though. I got in on a deal at Tanga and picked up a copy for only $27.99. It MSRP’s for $50 but at most online discounted stores it’s around $33. Picking the right combination from the 14 different fantasy races and 20 unique special powers, players rush to expand their empires – often at the expense of weaker neighbors. Yet they must also know when to push their own over-extended civilization into decline and ride a new one to victory! Jared found a “garage sale” of games on BGG and wanted to take a road trip to Cincinnati to buy 6 or 7 of them. He offered to pick up games for others in our group and when all was said and done, I think he bought a dozen games. I managed to pick up Primordial Soup and the Freshly Spiced expansion for 5-6 players and Container. Both Primordial Soup and the expansion are still in shrink and the cards in Container are still in shrink so all three are basically new games. The whole lot only set me back $55 so I was pretty happy about that. Primordial Soup pits players controlling amoebas against one another in a struggle of life. Amoebas need to gain genetic advancements to outwit other players in their quest for life in the Primordial Soup. The games contains an often joked feature of requiring amoebas to eat the ejected poo of other amoebas during the game. Of course, you can only eat the other amoebas poo ’cause eating your own is…well that’s just nasty. 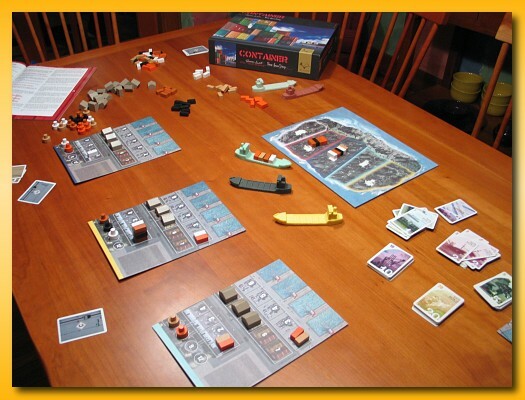 Container is a game of determining what to produce and what products to ship to maximize profits. The game contains some pretty cool looking container ships and some cool shipping containers to load onto them. 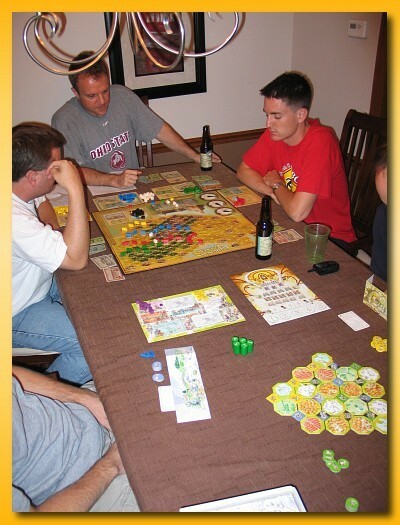 A recent BGG geeklist featuring game room prOn had me, again, trying to explain my gaming table. Having attempted this numerous times and after having to find pictures that help explain the mechanism, I figured I’d write it all down once and then use this blog item to explain it when the topic comes up again. 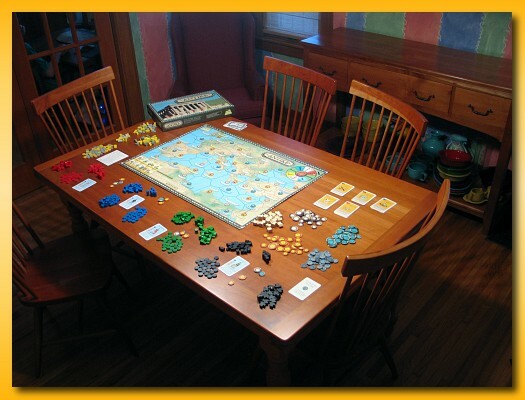 My gaming table (which doubles as my dining room table) has a double thickness top that when arranged in its smallest form, comfortably seats 6 at 38″ x 60″. Great for your basic board game. When you need more space, it can be opened to double its size (separating the double thickness top into two single “tops”) which comfortably seats 8 at 76″ x 60″. 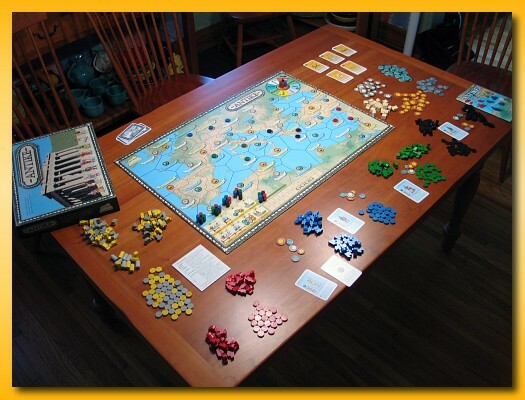 In the “open” configuration, you can accommodate two smaller games or one large game. To open the table you rotate/spin the both thicknesses of the entire table top parallel with the floor counter-clockwise. The table top, however, doesn’t pivot from the center. Instead, the table is bolted to the legs in a position offcenter and more towards one end of the table. This pivot position allows the table top, when rotated 90 degrees, to arrive centered at the far end of the now exposed frame and legs. In its final position, the hinges along the edge of the double thickness top allow a single layer of the top to be lifted up, over, and down to cover the exposed frame and legs effectively doubling the size of the table. 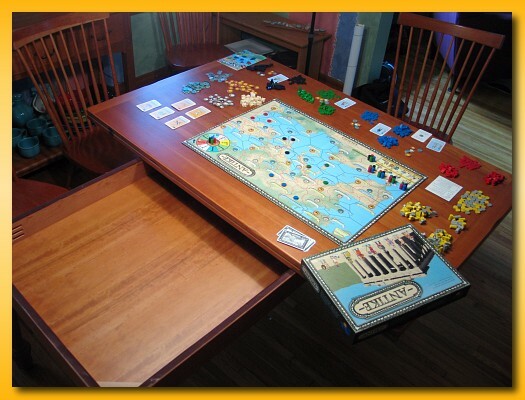 I love this table for gaming and to be honest, we sort of lucked into it wanting a dining room table that was normally small but could be opened for larger gatherings without having to drag out leaves and have all the extra cracks running through the table. It has really worked out well for the two gaming groups that come over every month allowing us to run games at each end for 6 to 8 players. I was looking over my collection tonight and I started writing down my unplayed games. 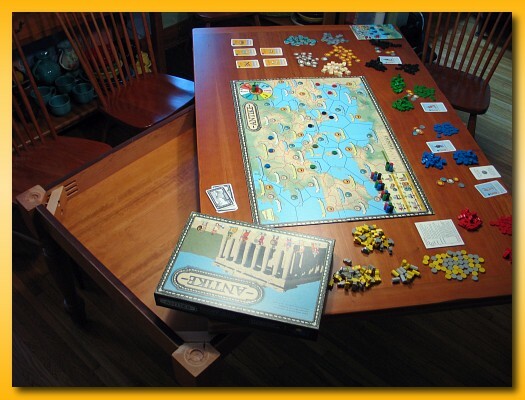 I got depressed at 15 and I decided to pull out Antike, read through the rules again, and play some sample turns. Boy…I’m on wooden bit overload. I originally bought Antike because of Mac Gerdts’ wonderful “rondel”. I love that mechanism in Hamburgum and could not resist another game that featured it. It took a good 15 minutes to sort out the wooden bits and to set up the double-sided board (another thing I like about Hamburgum) for some sample rounds with 4 playing solo. I’m still digesting rules but needed a break from all the bits. We met at Bob’s house for the August 2009 installment of Analog Game Night. Bob, Jared, and I have been on a buying binge lately and have several games in the wings that we’re itching to get played. So for the last couple of game nights we’ve been sending out links to the rules of at least two games we’d like to get to the table so that if anybody wants to read up on the rules before coming they’ve got easy access to the information. I think it’s been working well. I don’t know if anybody is reading the rules but it at least gets the games to play narrowed down to some reasonable amount so we don’t waste time hemmin’ and hawin’ about what to play out of a big collection. We split into two groups of three and at the far end of the table, Bob taught Chicago Express while at the near end, I taught Keythedral. The Chicago Express group finished up about 20 minutes before my Keythedral group and they broke out Sushizok im Gockelwok as a filler until we finished. We lost Tim at the break and after hanging out a bit eating food and talking shop in the kitchen we looked over Bob’s collection and decided we had a rare opportunity to play the same game back to back so we set up Chicago Express again and Brian and I joined the group making five. Chicago Express is a medium-light “route-building” game. It’s lighter than Stephenson’s Rocket but heavier than Ticket to Ride. For our group, it’s positioned nicely in the bell-curve of complexity of what people usually enjoy. It’s listed at 60 minutes for 2-6 players; a neat package to get a medium-weight game covering that large spectrum of players in such a short play time. I’ll not go into the rules but at a high-level, players vie to earn the most money and to ear that money, they purchase shares of stock in various train companies. Players holding stock have the opportunity to raise more capital by auctioning more shares, expand the train’s network across the eastern half of the USA, or build houses along the route enhancing revenue. At various points during the game, dividends are paid out to stockholders. Somewhat akin to the mechanic in Steel Driver, the money bid to buy a share of a company doesn’t go to the bank. Instead, this money is placed in the company coffers and is used by players holding stock and wishing to extend the line. This approach adds a nice touch to the game since players may need to raise their bid higher than they’d like so that the company has enough money when it comes to build across occupied cities or over the mountains where track gets expensive. Shares of stock have minimum values based on the current income level of the company and the number of issued shares. This keeps the stock price high for those late game purchases that one might otherwise wish to offer a low-ball bid. The other interesting item to note is the lack of selling off your shares at the end of the game. The game end is triggered when one of several situations occur and at the end of the round a final general dividend is paid and everybody counts their money. In many games it’s common to sell off the items you amassed throughout the game but in CE, your job is to maximize your earning without selling off your shares at the end. I was thrown off a bit by this but I think it may prevent large swings in final money counts that might occur otherwise. Overall, CE is a good game. I’m not convinced something isn’t amiss with the way the red train has the potential to dominate the map without a third shareholder actively sabotaging the efforts of the player holding two shares. Time will tell. Keythedral is categorized as an auction/bidding game but that seems a bit off. 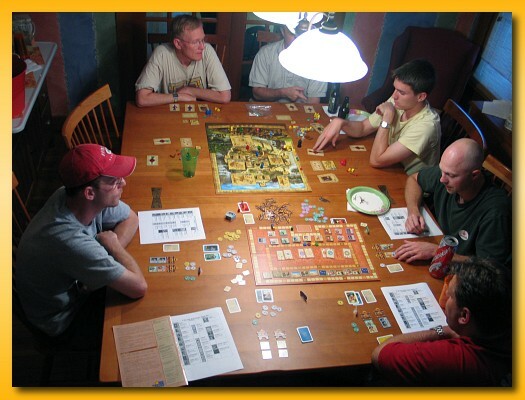 It’s an older game, published originally in 2002, for 2-5 players lasting about 90 minutes. 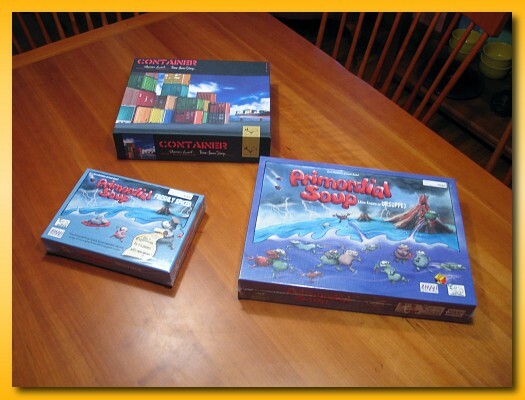 The designer, Richard Breese (Reef Encounter) designed the game to fit in a series of games (The Key Series) set in a fictional location called Keydom. 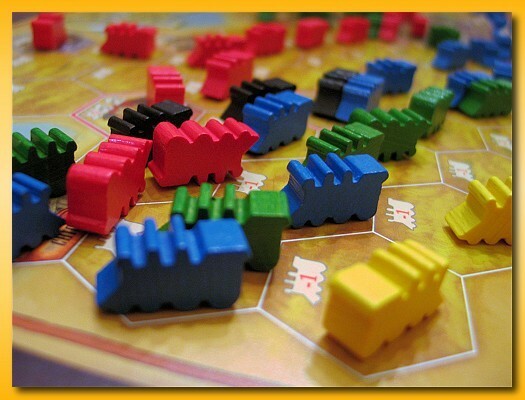 At the time it was compared to the much older Settlers of Catan and named the next game Catan players should migrate to. I have no idea what precipitated that thought because I found little to no similarity between the two games beyond a vague sense of familiarity during the initial setup. Players vie to earn victory points. 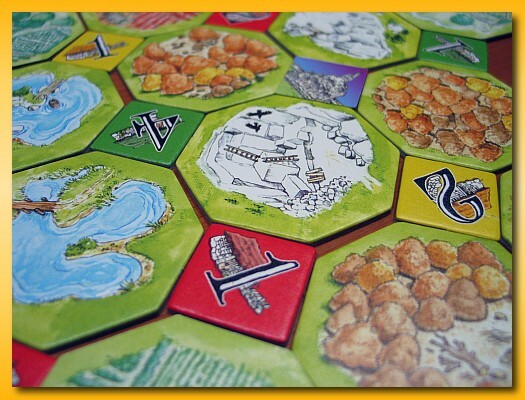 The game begins by players flipping up octagonal-shaped terrain tiles and placing them on the table to form the map of Keydom. In between the tiles, players place numbered cottages. During play, the cottages house workers who emerge into the adjacent tiles to work the ground to produce resources. 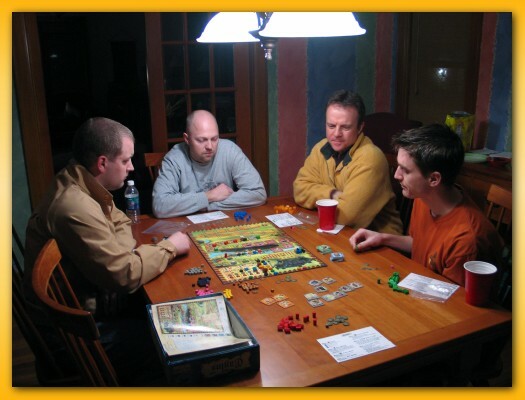 Players take turns placing tiles and (somewhat like Settlers) the initial setup of cottages can be crucial to having a fighting chance. Once the map is built, players take turns selecting which numbered cottage will emit worker(s) into the fields. Workers in fields block workers trying to emerge from a cottage later in the round. Once all workers have been placed, players receive the resources their workers produced and players enter a phase of the game where they can use resources to buy victory points, upgrade cubes to different kinds of cubes only available from their respective craftsmen, etc. The game is really a cube shuffling and turn order manipulation game but I found it quite enjoyable to play. The rules are much easier to grasp than Breese’s Reef Encounter but the game still clocks as a relatively heavy game. At the end of each round, players can use some of their cubes to bid for the ability to select the start player for the next round. The start player always moves to the next player at the end of the round and the player to the new start player’s left starts the bidding. Players can pass or must bid higher than any previous bid (with the exception of the last bidder – the new start player). This player only has to match the highest bid. But the twist is that the winner bidder must give the cubes bid to the last bidder that was outbid! Once the privilege is won, the player can choose the start player for the round. 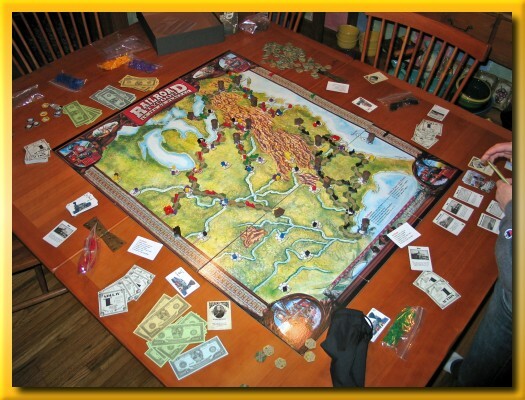 There is a phase of the game where play moves around the table until all players are done taking actions. 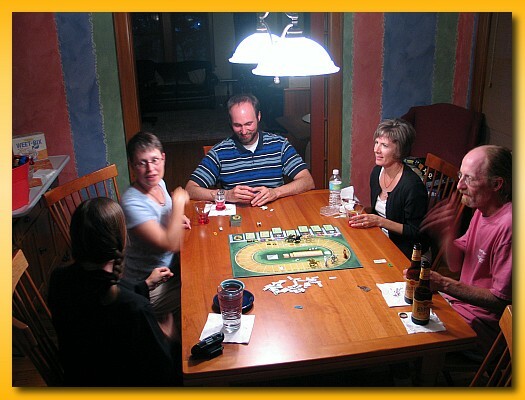 Each time around the table, players can take one action or pass. Passing doesn’t mean you’re out though. If not everybody passes you can come back in and take another action. However, your ability to take actions can be cut short if, as your action, you purchase a “Law” card. The law cards allow you to do special things throughout the game and they’re usually good for one event and then they’re discarded. The Law cards adjust the parameters of the game allowing players to pay less for items than that listed, force other players to pay more, etc. And finally, players are given three fences and during the phase of the game mentioned above, players can build fences around cottages to prevent workers from emerging into the adjacent fields. Wise fence placement can turn an under-producing field (always gets shut out during worker placement) into a something useful. However, watch out for those Law cards, players can jump fences, build more fences, etc. to thwart even the best laid plans. I liked Keythedral a lot and look forward to more plays. Well, enough rambling. Thanks for hosting Bob.